November, 1815. The Battle of Waterloo has come and gone, leaving the British economy in shreds; Henry Austen, high-flying banker, is about to declare bankruptcy—dragging several of his brothers down with him. The crisis destroys Henry’s health, and Jane flies to his London bedside, believing him to be dying. While she’s there, the chaplain to His Royal Highness the Prince Regent invites Jane to tour Carlton House, the Prince’s fabulous London home. But her visit takes a startling turn when Jane stumbles upon a body—sprawled on the carpet in the Regent’s library. The dying man utters a single failing phrase: “Waterloo map,” sending Jane on the hunt for a treasure of incalculable value and a killer of considerable cunning. "With a keen sense of plot—the identity of the villain surprises—perfect pitch for Austen’s voice and a cast of new and familiar characters, Barron has again produced a pleasant excursion into literate and historical escapism." "Absolutely delightful, with just the right balance between likable, captivating characters and the actual history of Jane Austen’s life." 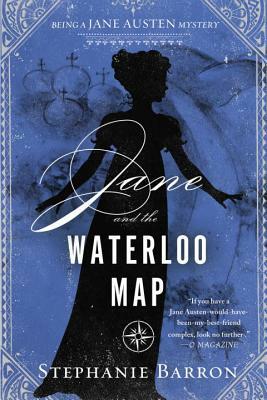 "Jane and the Waterloo Map is a pleasant excursion into England of the early 1800s. This is a well-told story by an accomplished author." "This book is a delight for Jane Austen fans . . . as if you are stepping through the page into Regency England. False trails, misleading information, and suspicious characters keep readers turning the pages." "A well-crafted narrative with multiple subplots drives Barron’s splendid 13th Jane Austen mystery. Series fans will be happy to see more of Jane’s extended family and friends, and Austenites will enjoy the imaginative power with which Barron spins another riveting mystery around a writer generally assumed to have led a quiet and uneventful life." "Barron, who's picked up the pace since Jane and the Twelve Days of Christmas, portrays an even more seasoned and unflinching heroine in the face of nasty death and her own peril." "Barron deftly imitates Austen’s voice, wit, and occasional melancholy while spinning a well-researched plot that will please historical mystery readers and Janeites everywhere. Jane Austen died two years after the events of Waterloo; one hopes that Barron conjures a few more adventures for her beloved protagonist before historical fact suspends her fiction."